Heavy-handed policies of the United States and the European Union are pushing Bosnia towards civil war. What is even worse from an American standpoint is that no one in Bosnia has a real vote. All three groups of Bosnians vote regularly, but any decisions they make via the democratic process can be instantaneously overruled by one man — an Austrian representative of the United States and the European Union. 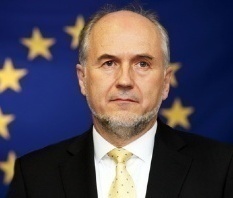 That man is Valentin Inzko, the High Representative for Bosnia and Herzegovina and European Union Special Representative to Bosnia and Herzegovina. He represents the interests of the United Nations, the European Union, the United States, and pretty much everyone except the Bosnians. This person has complete dictatorial control over political life in Bosnia. His decisions do not require hearing of the people concerned and they cannot be appealed. He has the power to “fire” the peoples democratically elected representatives and to ban them from public office for life. Mr. Inzko and his predecessors have used this power hundreds of times to fire politicians and civil servants — and also to freeze their bank accounts without due process. Frustrated by the people’s refusal to elect leaders that are sufficiently submissive, the High Representative now reviews candidates of all political parties before they are allowed to run for office. The people of the Republika Srpska wish to leave this artificial and untenable “nation” and seek their own happiness as either an independent nation or as a state within the nation of Serbia. Many of the Croats in the Federacija wish to do the same. Their natural desire to rule themselves via democratic processes is being prevented by the United States and the European Union. They are seeking freedom and we are denying it to them. For over two hundred years the United States has acted as a beacon, spreading the light of democracy and dispelling the darkness of totalitarianism. And yet, in the current day, we are supporting the same type of authoritarianism that our forefathers fought and died to destroy. This is a national shame.